Bit behind on some news but thought it was worth giving the superb Yeasayer performance on the Later with Jools Holland show a mention. I went to see these guys at the London ICA last month and I love them! 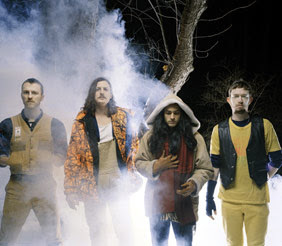 "New York indie alternatives Yeasayer blend multi-part harmonies with a smattering of religious chant to create rhapsodic tunes that emanate from the most unlikely looking of 4-pieces. Describing themselves as "Middle Eastern-psych-snap-gospel", their polyrhythmic bizarreries are gaining them the recognition they deserve this side of the pond." They sure do and they sure are! and here is a really sweet Bodhran accompaniment to the same song (2080) in response to their performance on the Jools Holland show by a you tube performer.